Every two weeks, Big Issues focuses on newly released comic books of significance. This week, they are Doctor Strange #384 and Thanos #15. Written by Donny Cates (God Country, Redneck) with art by Gabriel Hernandez Walta (Magneto, The Vision) and Geoff Shaw (Buzzkill, God Country) and colors by Jordie Bellaire (Magneto, The Vision) and Antonio Fabela (The Amazing Spider-Man, Lucifer), these two one-shot spotlight how Cates has quickly become one of Marvel’s heavy hitters. This review reveals major plot points. Much of the underwhelming Marvel Legacy initiative has involved giving readers more of the same, but two of Legacy’s bright spots come from a writer getting his big break at Marvel after building a reputation for creator-owned comics with big stakes, exhilarating action, and rich characterizations. Books like Buzzkill and The Paybacks had Donny Cates building his own superhero universe with concepts like a recovering alcoholic superhero whose powers come from intoxication and a team of costumed repo men (and women) who collect outstanding debts from members of the superhero community, proving that he can find interesting angles for the genre while delivering the excitement readers expect from these stories. He worked on a few short stories for Marvel over the years, but he’s stepped into a more prominent position in the publisher’s line-up after signing an exclusive contract and taking over the monthly Doctor Strange and Thanos series. Putting Cates on Captain America in the midst of the controversial Secret Empire event felt like a test of his loyalty to the publisher, and he was rewarded with two ongoing assignments starring characters Marvel is desperate to popularize. Doctor Strange has him working with The Vision’s Eisner Award-winning art team of artist Gabriel Hernandez Walta and colorist Jordie Bellaire, and the first thing he did was completely upend the status quo for Stephen Strange: Loki is the new Sorcerer Supreme, Stephen is a veterinarian, and the Sentry is now a major part of the book’s cast, used by Stephen to absorb the physical damage caused by using magic. Thanos is the fourth collaboration between Cates and artist Geoff Shaw, having previously worked on Buzzkill, The Paybacks, and last year’s God Country, which showcased their ability to balance the cosmic with the personal. God Country was centered on family, but the previous Thanos creative team just took a family-centric approach to the character, so Cates and Shaw go in the opposite direction to explore Thanos as a solo presence in the universe. They do this by using a familiar superhero device: sending Thanos millions of years into the future to meet a version of himself who is king of the universe he killed. The dichotomy of light and dark is at the core of the Sentry, and his addition to Doctor Strange has allowed Cates to amplify the moral conflict brewing inside Stephen Strange. 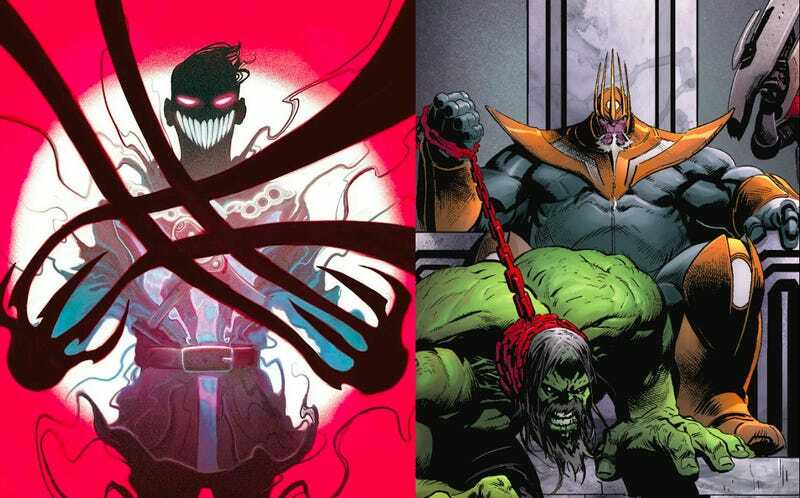 With the heroic Sentry comes his malevolent dark side, the Void, and Stephen’s path in the current storyline eventually leads to him getting sucked into the abyss after stealing magic from the Asgardian world tree. Walta and Bellaire are an ideal art team for a story rooted in contrasts. There’s the contrast between light and dark in Walta’s dense inks and Bellaire’s restrained palette, which also amplifies the contrast between fantasy and reality. In last week’s Dr. Strange #384, Bellaire sticks to a palette of urban grays and browns as Stephen and Loki face off in the street, a drab backdrop for the bright pink and green used for their magic spells. Part of Bellaire’s ongoing use of pink as a color to represent sinister and dangerous story elements (see: her work on Pretty Deadly), Stephen’s Asgardian magic appears much softer than Loki’s green energy. But that pink hue disguises the devastating potential of Stephen’s godly power. The visuals become more vibrant as Stephen and Loki leave Earth and travel through Dimension Blood, the “ancestral nesting ground of the cancerous Vampa Cabra warriors,” but nearly all the color is stripped away in the final scene, which literally thrusts Stephen into darkness as he unleashes the Void. Walta brings a sensational flair to the superhero fisticuffs, but his strengths as an artist come through when he gets the opportunity to create more subtle, haunting imagery, which is what makes the end of Doctor Strange #384 so satisfying. The page of Stephen unleashing the Void is a chilling turning point in this arc, beginning with a shot of Loki watching as a black cloud descends on Stephen, already full of regret for what he’s done. The thin horizontal panel that follows has Stephen in profile, with the length of the panel being used to show the tendrils of the Void closing in on him. He’s visibly ashamed and sullen, but once the Void has him, he doesn’t feel anything at all. A close-up on Loki’s face highlights his terror, a severe emotion that heightens the impact of Stephen’s blank gaze when he succumbs to the darkness. He has no more agency, and when Walta returns to the previous thin horizontal panel composition, Stephen is almost entirely off-panel with the exception of one hand reaching out with no one to pull it to safety. Both Dr. Strange and Thanos are exploring themes of Cates’ past work in new contexts, with Doctor Strange offering a fantasy-infused look at addiction and the cost of achieving that magical high. It’s more subtle than something like Buffy’s sixth season or Buzzkill, but there’s still that central idea of wanting something that you know is detrimental and finding new ways to justify that behavior. Stephen Strange sees Loki as a threat because Loki has a tendency to do awful things with power, but decisions that are beneficial in the moment have long-term consequences. Between the Asgardian connection, Stephen’s new job, and the presence of the Sentry/Void, there’s enough new story material in this first arc to fuel a run that lasts for years, and there’s a lot of potential for this creative team to make Doctor Strange a central character in the Marvel Universe. In Thanos, Cates is looking at the limits of power without love, and while God Country had its hero relishing his personal relationships, Thanos examines a tragic figure who has completely cut himself off from the world in his obsessive quest for affection. He’s in love with Death, but she refuses to take him, no matter how much of the universe he kills in her name. Internal conflict is important for making characters complex and engaging, but that’s hard to create with a fundamentally amoral character like Thanos. Unless you have two versions of him who clash because they’re from drastically different points in his life. The present-day Thanos has renounced Death and believes himself to be free of her influence, and he laughs at this future version of himself who is still love’s slave. This is a book about pride, obsession, and loneliness, and Thanos’ ego prevents him from seeing the inevitability of his future. King Thanos isn’t a person who would openly express his misery, but it comes through in the presentation of his lifestyle, a wretched routine where he ambles around his gigantic empty fortress and gorges on raw meat while he pines for Death and waits for a new thing to kill. (The leftovers are fed to Thanos’ dog, a feral Hulk that lives on a pile of remains that include Wolverine’s arm, Captain America’s shield, Hawkeye’s bow, Doctor Octopus’ tentacles, and the helmets of Magneto, Ant Man, Thor, and Nova.) It’s a pitiful sight, and there’s an undercurrent of sadness that reinforces the tragedy of being Thanos. Thanos #15 begins with a close-up shot of Cosmic Ghost Rider’s blazing skull as he unleashes his Penance Stare, which serves three storytelling purposes: It’s an aggressive, dramatic image that grabs attention; it puts the reader in Thanos’ point of view; and it’s a big clue to the identity of King Thanos’ insane right-hand man. What other very popular Marvel hero has a giant skull as his symbol? This issue reveals that Cosmic Ghost Rider is Frank Castle, who has completely lost his mind after being at Thanos’ side for millions of years. In retrospect, it seems obvious given that Ghost Rider’s breastplate evokes the skull imagery of the Punisher’s costume, but the characterization of Ghost Rider as an almost clownish character is so far from Frank Castle’s typical personality that it’s easy to look past that connection. Ghost Rider provides comic relief, but this revelation ties him to a major theme of the book that given enough time, people can change in unfathomable ways. Thanos’ obsession with Death isn’t anything new, but after millions of years, he’s become vulnerable to the despair of never-ending unrequited love. Shaw can deliver moments of nuanced emotion, but in general, his artwork with colorist Antonio Fabela has a much more spectacular, in-your-face quality. Fire plays a big role in this issue, starting with the Penance Stare splash setting up a two-page spread of Thanos in the middle of an inferno, reliving the atrocities that should destroy him with sorrow but instead leave him with a gratified smile. Fire is often used as a light source, but it also has expressive qualities in this issue. When Ghost Rider reveals his past identity, the flames shoot up with a velocity that adds a visual exclamation point to the dialogue. The texture of that flame is very different from the fire that calmly flows out of King Thanos’ sword, reflecting the smoldering intensity within the character. His fire is focused in a way Ghost Rider’s is not, and at the end of the issue, King Thanos has an opponent to unleash his power on when the former Silver Surfer (now known as The Fallen One) shows up riding the Annihilation Wave. The current run on Thanos is a compelling direction for the character, but there’s one person displeased with the story: Thanos creator Jim Starlin. In December, Starlin took to Facebook to say why he was cutting ties with Marvel’s comics division, explaining that executive editor Tom Brevoort approved a Thanos storyline that was very similar to what Starlin was creating in next month’s The Infinity Siblings graphic novel. It was to be the start of a trilogy written by Starlin, but the issues of the ongoing series would come out beforehand and make his story redundant. Starlin refused to go into the specific similarities between the two stories, so it’s not clear just how much overlap is there, but it’s enough to compel Starlin to end his relationship with the publisher. The blame falls entirely on Brevoort in this situation, and he created the problem by approving Cates’ Thanos story when Marvel already had 200 pages of Starlin’s script and 100 pages of Alan Davis’ pencils. Did Marvel editors tell Cates that Starlin was writing a similar story? This puts Cates in a difficult position just as he’s starting to gain traction at Marvel, and serves as more bad publicity for the publisher at a time when it’s already struggling. One question that emerges from the Starlin situation: How much obligation do comics publishers have to giving new work to the creators who helped build their universes? This week at DC Comics, Teen Titans icon Marv Wolfman is writing a stand-alone issue of Teen Titans and begins a new 12-issue miniseries spotlighting Titans member Raven. He’ll also be the new writer of the ongoing Cyborg series, even though his writing for the last Cyborg series was bland and uninspired. Wolfman created both Raven and Cyborg with artist George Pérez more than 30 years ago, but that shouldn’t give him first dibs on writing modern stories with these characters. Teen Titans is a property with a large, young fan base thanks to the success of Teen Titans Go!, but Wolfman doesn’t write comics that are easily accessible for that audience. He’s had his go with the team, why not let promising new talent show what they can do with the property instead of putting these characters in familiar hands? The same can be said of Thanos. Jim Starlin created the character, but can he write comics with a sensibility that will bring in readers introduced to Thanos through the Marvel Cinematic Universe? He shouldn’t have to. In a perfect world, he would be able to live comfortably for the rest of his life off the profits made by the multi-billion dollar franchise built from the stories he wrote. Josh Brolin is probably getting a cut of Thanos action figures, but I doubt the same can be said for Starlin. He’s open about how he’s been compensated for his comic-book creations appearing on the big screen, and last January, he posted on Facebook that DC paid him more for the use of minor heavy Anatoli Knyazev (the comic-book K.G.Beast) in Batman V Superman: Dawn Of Justice than Marvel Studios did for Drax, Gamora, and Thanos in all of their movie appearances, combined. This is all part of a bigger conversation surrounding creator rights as superheroes continue their pop culture dominance, and there are some fans who aren’t going to give the current Thanos series a chance because of the drama surrounding it behind the scenes. That’s a shame, because this is a book that is bringing new depth to a character too often portrayed as a shallow Final Boss, but you also can’t fault readers for choosing not to engage with a piece of art when you don’t agree with the practices of the institution that created it. Most superhero readers have made their peace with the unscrupulous aspects of this genre’s history—just look at the success of DC’s Doomsday Clock—but wouldn’t it be nice if reading superhero comics didn’t require ethical compromise?